The Kansas City Chiefs announced today that they have hired former Miami Dolphins offensive coordinator Brian Daboll as their offensive coordinator. Daboll was one of the three finalists, along with former Raiders offensive coordinator Al Saunders and (gulp) Chiefs quarterbacks coach Jim Zorn, for the coaching job. 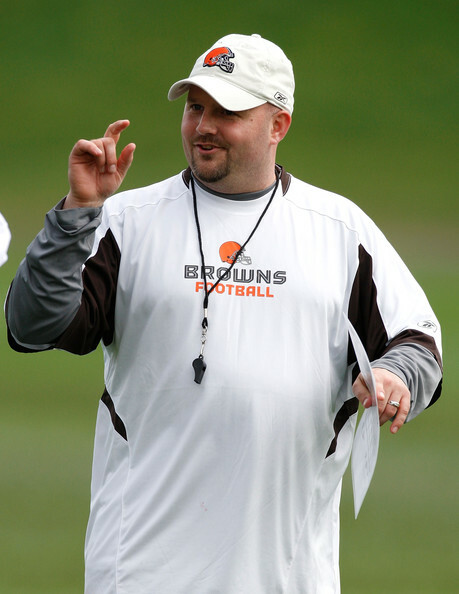 Daboll was the Dolphins’ offensive coordinator in 2011. Now before you protest in shock (The Miami Dolphins offense?! Are you kidding me) you must realize that this was the first time in the Dolphins history to have a player rush for 1,000 yards (Reggie Bush) and have another player have 1,000 receiving yards (Brandon Marshall). The first time ever. I don’t care if you’re the baby from E-Trade, if you’re the first to do that for a storied team like the Dolphins, you should be looked at and considered. I like Coach Daboll because of how well he can draw up plays and recognize defenses. Although under Daboll the Dolphins ranked a miserable 22nd in total offense and 20th in points (20.6 per game) this season, they performed much better in the second half of the season, and they were missing their quarterback Chad Henne to injury and playing with Matt Moore. And, although a small jump, it is better than the Chiefs offense, which ranked 27th in the league and averaged only 13.2 points per game in 2011. Interestingly enough, Daboll has worked with Chiefs quarterback Matt Cassel, who entered the league as a seventh-round pick of the Patriots in 2005. Daboll was the Patriots’ receivers coach from 2002-06. So expect Cassel to be the starting quarterback next year. This hire seems fitting because all Scott Pioli refers to is “The Patriots Way”. And since Daboll was with the Pats, he will fit in perfectly. I assume that Jim Zorn will have a major role in the offense as well because of his experience and the familiarity of the team. The major void that the Chiefs have is still at the quarterback position. It is clear that Matt Cassel cannot win a Super Bowl. It will be interesting to see how the Chiefs and Pioli address the quarterback situation and the roster with the draft and signing of free agents, most notably Brandon Carr and Dwayne Bowe. And people were saying that football is done for the year. This entry was posted in Football, Home, Midwest, Uncategorized and tagged Brian Daboll, Chiefs, Football, NFL, offense. As good as Scott Pioli happens to be as a front office executive I get the feeling that this organization is simply two or three years away from a legitimate contender within their own division and conference as a whole in spite of the diabolical football being played in the AFC West ! Crennel was a great choice to succeed Todd Haley and the players are buying into what he’s selling . Please message me when you have the chance. I was hoping to have a chance to exchange some blogging ideas with you guys. This was intended for the guys of kcyoungguns. Sorry if I put this in the wrong place. Hey Mike, email me at smontgomery2012@gmail.com so we can talk about your blogging ideas. Don’t look now, but you might have a legend on the way. It wasn’t that long ago that an aging Joe Montana graced the KC franchise. Maybe Peyton Manning would be willing to come there too. Crennel and Pioli come from the Pats, after all, and maybe Manning would be interested in giving it a go. With all the theories floating about, my Peyton to KC doesn’t seem all that insane, does it? I know I’d watch those games. That seems totally plausible and, speaking on behalf of all Chiefs fans, I think we would absolutely love to have Peyton play at Arrowhead. It seems as if this franchise and its fans have grown accustomed to seeing below average quarterback play from the last 5-7 years. We are ready for a winnner; a quarterback that can win a playoff game and not simply follow the gameplan of “not losing the game.” Although I do think if we get Peyton, the quarterback position stil needs to be addressed in the draft (probably not first round), so the Chiefs can start developing a quarterback. I think you’re right on both counts. There’s always the possibility that Peyton’s neck could limit him. But I’d rather take my chances with 75 percent of Peyton than with 100 percent of anyone the Chiefs already have. I don’t know if Peyton would be interested in mentoring his replacement, given how the situtation in Indy went down. And I am also reminded of Favre and Rodgers. I thought Favre was a stand up guy, but he didn’t do squat for Rodgers, other than cause his career to start three years later than it could have.